Pictured: Prospective employees give advice to students looking for jobs in the workplace. 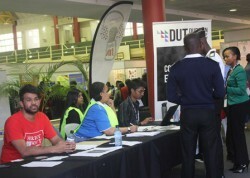 Learning about job and internship opportunities offered by companies, was the order of the day at the two-day World of Work (WOW) Careers Fair which was held at the Fred Crookes Sports Centre at the Durban University of Technology (DUT) from 6 to 7 August 2014. 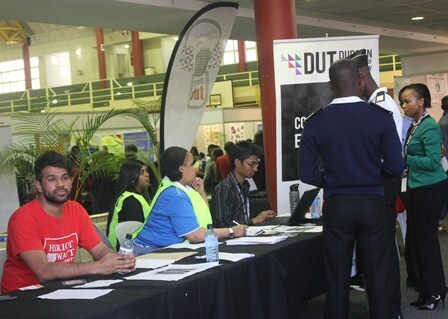 The DUT World of Work, which is now in its eight year, attracted 115 companies who participated in the Careers Fair – which was organised by DUT’s Department of Co-Operative Education. The Department of Co-Operative Education’s role is to provide an integrated approach to higher education which combines academic learning and associated workplace experience, which is achieved through the relationship between the university, its students, industry and the community. Companies such as Transnet, Huletts, SABC, Hilton Hotel, The South African Navy, CHIETA , South African Tourism, HULAMIN, WISA, Lancet Laboratories and Siemens to name but a few, were exhibiting at the fair. Thousands of DUT students flocked to the event, in the hope of finding places to complete their work integrated learning and possibly find full-time employment. The job fair also provided a convenient location for students to meet employers and perform their first interviews.